The Software Utility presented here is named as Window Relocator. As the name suggests this software application can be used to relocate any given window to a fixed location every time it starts. Yes this software utility can be used on a single or multiple monitor windows computer having 32 bit or 64 bit architecture. The Window Relocator has been tested on Windows XP onwards to Windows 8 versions and it works fine. There are two parts in the main user interface of the Window Relocator. The First half displays application window’s name and other details as and when they appear. Any of the Window that appears in the upper half can be set to appear at a defined location. In order to pin or fix any application startup position, all you need to do is launch that application window, find out whether it appears or not in the upper list of the Window Relocator or not. In case you desired window does appear in the upper list of Window Relocator then you are ready to move on to the next step. However in case your desired application window does not appear in the upper half of the Window Relocator, then you would need to contact support team of the software, so that they can have a look and possibly provide you a solution. 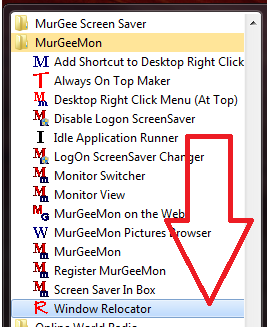 Once you have made sure that whenever you launch a new instance of the desired application window, it does appears in the upper half of the Window Relocator, the next step would be to manually move that window (possibly by dragging caption bar of the application window) to the desired position. It does not matters whether the new startup location of the selected window is on first, second or any other monitor on a multiple monitor window or the new startup location of that window is on the main or single primary monitor of your windows computer. Just move the desired window to the new startup position, locate the window title in the lower half of the Window Relocator, select that window title and click on Set Button. Open the window (Let’s say it as Target Window) for which you want to define the new fixed startup position. Find out whether your desired window appears automatically in the upper half of the Window Relocator or Not. In case the Target Window’s title does appears in the upper half of the Window Relocator automatically, only then you must proceed to the next step, else write to the software support team. Move the Target Window to the new startup position by dragging through the title bar. Locate the Target Window Record in the bottom half of the Window Relocator & Double Click on it to mark it to open at specified location . That’s it, next time onwards you start the application having the Target Window, it will move to the position defined automatically with a short delay. In case you close or exit the Window Relocator, the normal application behaviour of the Target Window will come into effect. Although the above steps might sound like large number of steps to be performed in Window Relocator to define a fixed location for the target window, using Window Relocator can become really easy as you use it multiple number of times. When the Target Window is visible and not minimized, you can use the Remove button to remove the window to open at a fixed location.